Published: Nov 9, 2015. 08:23 +0100. For the last couple of years, SiteGround has integrated and developed a number tools aimed at streamlining website development that is very helpful for developers, bloggers, and business owners. From WordPress and Joomla one-click website Staging, Git Integration, WP-CLI, to simple WordPress Joomla Tools, SiteGround is poised to speed up your development process or simply make developing your website so much easier. It is not just about the development tools that make SiteGround perfect for developers. With the fast support (ticket responses within 15 minutes), you won’t waste time troubleshooting web hosting issues. Plus with their NGINX + Memcache based SuperCacher your clients will be awe-struck at the website speeds, giving you an excellent reputation for providing fast websites. Plus, if you need a little more power and freedom, then their auto-scalable cloud hosting comes HHVM as well. Introduced in May 2013, Site-Staging was SiteGround’s first foray into making life easy for developers and bloggers alike and is available on their GoGeek plan. Many web design companies will setup development servers, whether on the local machine or a web server and only once they are happy and have tested the website will the website go live. SiteGround Staging does exactly that, albeit in a very easy form. You can create a staging copy of your website, modify it, test it and once you are happy with it move it to production (the live server) with one click of a button. Plus, to be safe, they will automatically backup the existing website before making the staging copy live. Unfortunately, many webmasters still develop and alter things on their live website. It doesn’t take a genius to see the potential for disaster doing it this way. Create stating copy. © Screenshot. SiteGround’s Staging is currently available for Joomla and WordPress development. SiteGround did a Google Hangout to launch their second version of the SiteGround Staging Tool at the beginning of April 2014. This goes into much more detail and includes a video walk-through of the tool. You can watch this video, and find out about the SiteGround Staging tool here. SiteGround introduced the Drush Command Line Interface (CLI) for Drupal in June 2013. Drush is a command line interface tool (via SSH) that allows you to manage your Drupal website without having to log into the Drupal web interface. Drush Command Line Interface. © Screenshot. The command line interface can be quite difficult to grasp if you have ever used it before, but is highly rewarding if you use Drupal. Fortunately, it is not too difficult to understand the basics with a little help via a website called Buildamodule.com. This has some excellent tutorials at a very reasonable price which cover all you need to know to take advantage of these powerful features. A Command Line Interface (CLI) for WordPress was released hot on the heels of their Drupal CLI, toward the end of June 2013. WP-CLI allows you to manage WordPress installations without using the web browser. SiteGround has a great little tutorial explaining some of the commands, such as how to update WordPress, install plugins, and even take a database backup. Using the WP-CLI is easier than it looks, so even if you are a casual developer it is something worth trying out. As you can see, WP-CLI is very powerful indeed. 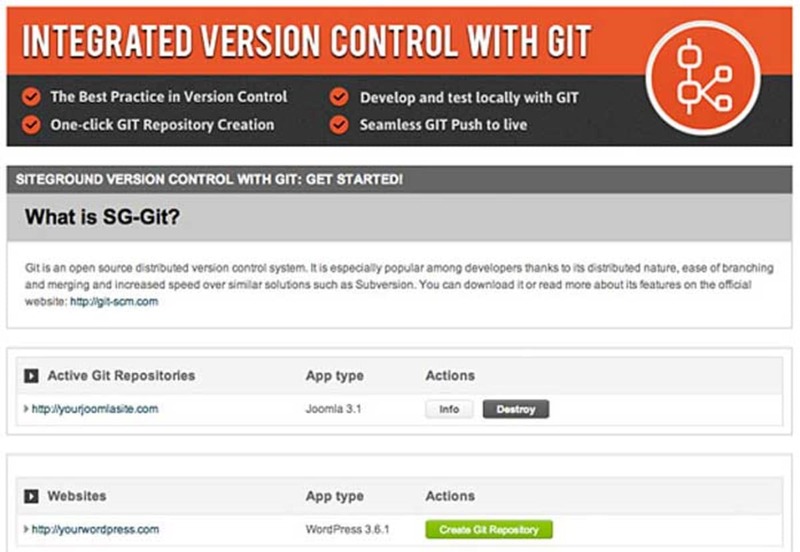 SiteGround launched their custom integration with the GIT version control system in late October 2013. GIT is an advanced version control for developers, and many will agree that it is “the best thing for deployments since sliced bread”. GIT is much more complex than the SiteGround Staging we talked about as you can have multiple branches with many people working on their own versions. GIT will then allow you to integrate all the changes together with a much finer degree of control. While some other managed hosting companies restrict which files that can put under version control (i.e. core WordPress files), SiteGround does not. They allow you complete control over your GIT repository. This example adds the WordPress core files to the ignore list. As a developer, you may use different workflows to accomplish the same tasks, and it will depend on your preferences and habits. Because of the way GIT is integrated at SiteGround you have that freedom. You can find an in-depth look at all the features of the WordPress Joomla Toolkit here. The Toolkit is available on ALL plans, and allow you to carry out several different tasks with a few clicks. Before now, to carry out these tasks, you would have had to implement them manually by using tools such as FTP, phpMyAdmin, etc. This could be time-consuming, or in some cases complicated for a novice developer. As such these tools are a great addition to any developers seeking web hosting. While not strictly something related to development, we all know that web designers and developers can be a little more demanding of their hosting company, with slow or sluggish hosting the cause of much frustration and that can reflect poorly when the customer previews their website. Well, SiteGround is one of the fastest shared hosting companies we know with their NGINX and Memcache technology in the form of their SuperCacher. This not only caches static content but will cache dynamic content and database queries into RAM for ultimate speed. Couple that with SSD storage, CDN, or their free CloudFlare Railgun then you have some serious speed. SiteGround has recently implemented PHP 7 (Beta!) on their shared hosting servers that are significantly faster and more efficient than PHP 5.6. PHP 7 is in beta, so you will need to test it out before using it in production. That being said, PHP 7 depreciates various PHP functions, so it is useful for testing your development website. If you want to try HHVM (HipHop Virtual Machine), you can do so with the SiteGround Cloud. You can see some benchmark tests between PHP 5.6, PHP 7 and HHVM here. Whether you are a novice developer or experienced, SiteGround has you covered with an amazing feature list. All you need is to sign up to their GoGeek shared hosting (this used to be their powerful semi-dedicated plan, and includes significantly more resources), Cloud or dedicated server and you get access to it all. The Toolkit is available on all plans. We urge you to check out some of the detailed articles about the various features referenced in this article. You can also read reviews from some of the many hundreds of users who highly recommend SiteGround. Plus, our readers can get a massive 60 percent off SiteGround hosting here.